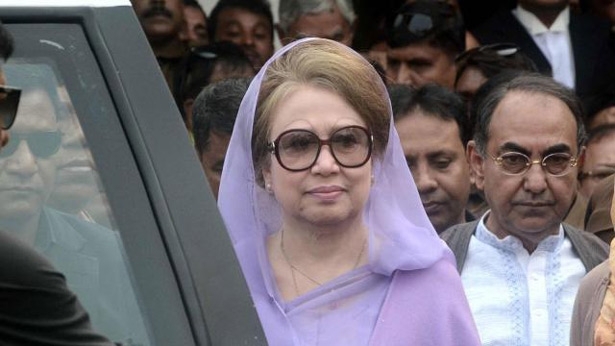 The High Court on Monday directed a Comilla Special Judge Court to dispose of BNP Chairperson Khaleda Zia's bail petition in an arson case filed under the Special Powers Act within a week, reports UNB. The HC also cancelled its earlier order that granted bail to BNP Chairperson Khaleda Zia for six months in the case filed in Comilla. The HC bench of Justice AKM Asaduzzaman and Justice SM Mozibur Rahman came up with the order after hearing arguments on whether the appeal filed by Khaleda seeking bail in the case was acceptable or not. Earlier on July 17, Khaleda Zia filed a petition before the court seeking bail in the case. On May 28, the High Court granted bail to the BNP chief for six months in two cases filed in Comilla. Later, the government filed a petition with the Appellate Division seeking a stay on the bail order, following which the HC stayed the bail on June 26. Eight people were killed and 20 others injured when miscreants hurled a petrol bomb at a bus at Jogmohanpur in Chouddagram ofCumilladistrict during the BNP-led alliance's movement on February 3, 2015. Two cases were filed against Khaleda in this connection. On February 8, Khaleda Zia was sent to jail after a special court sentenced her to five years' rigorous imprisonment in the Zia Orphanage Trust graft case.